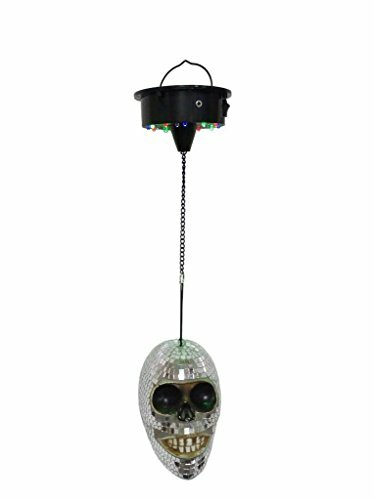 Lightahead LED Mirror Skull disco light. Bright Reflective Mirror Skull with sound sensor. Perfect for DJs, Bands, Pubs, Night Clubs, Discos or halloween decorations. Disco lighting effect enhances the festive atmosphere. Special design of the mirror skull catches your eyes. The mirror skull rotates and the light effect is very nice. Sound sensor is effective and useful. Very simple to assemble (manual included). Mirror Skull Size: 17.5 * 11 * 16 cm; Material: Plastic core ,mirror flakes on surface; for indoor use only. It is not a toy, just for decorative use. Function: hanging for decoration in Halloween. Voice LED control motor; Material: plastic; 18pcs led (4xR,4xG,4xB,6xW) on the motor, w/sence control; motor:5-6r/m, size:13X13X8cm. Power source 3xAA batteries operated (not included). Special design of the mirror skull catches your eyes. The mirror skull rotates and the light effect is very nice. Disco lighting effect enhances the festive atmosphere. Sound sensor is useful. Easy to setup. Connect the mirror skull to the motor metal chain and hang up. Voice LED control motor has 18pcs LED (4XR,4XG,4XB,6XW) on the motor , w/sence control. Requires 3xAA batteries to operate (not included). Hanging for decoration in halloween. The perfect light effect for your Halloween party. If you have any questions about this product by Lightahead, contact us by completing and submitting the form below. If you are looking for a specif part number, please include it with your message.